When you think of suave secret agents and covert crime fighting, 'Guess Who?' might not be the first thing that comes to mind. The board game classic is the kind of entertainment usually reserved for the occasional power outage or after a boozy Christmas dinner, but for Dan McFox it's his modus operandi when chasing down suspects. The latest title from Lightwood Games teams you up with the wily agent on the hunt for criminals of all shapes and sizes, but will it leave you feeling shaken or stirred? 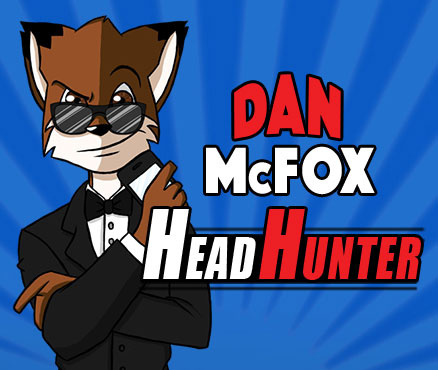 Dan McFox: Head Hunter is a remixed version of a game previously released on mobile devices, now available on the 3DS eShop as a budget title. This fast paced puzzler takes inspiration from the famed children's board game, testing your reflexes and a keen eye as you pick specific faces from a crowd. Gameplay is broken up into three different modes, with "Mission Mode" presenting the most structured challenge. In this, you'll tackle 60 different criminal cases ranging from cake thieves to meddling magicians. Similarly to the board game original, McFox will display a particular physical trait on the top screen - such as freckles or glasses - and you'll need to identify everyone in the lineup below that matches the description. As you whittle the faces down to a smaller number of suspects, the final round has you identify the character that shares all the previous traits before locking them away for good - the rascals! Everything is controlled using the touch screen, which allows for quick taps of the stylus as soon as you spot a potential suspect. It's slightly awkward having to switch your gaze back and forth from the description on the top screen and the lineup on the bottom, but it wasn't a major gripe. Our real disappointment is that without any drastic innovation, things get quite samey after only a handful of these missions and there isn't any dialogue or character moments to differentiate one from the other - save for their silly titles. 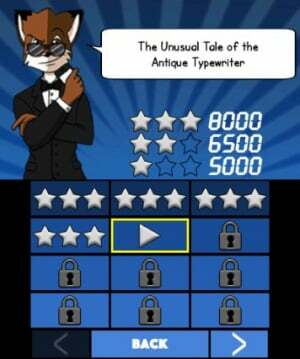 Perhaps showing its mobile roots, McFox's simple mechanics mean it's a game best experienced in short bursts, which alleviates the sense of fatigue somewhat. 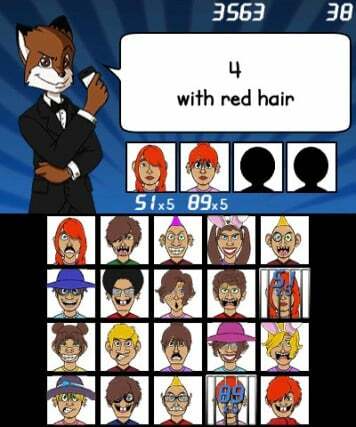 Thankfully there's also a more quickfire and arcadey "Round Up" mode that's better suited to this style of play, where you're given 60 seconds to rapidly identify as many suspects as possible from a random list of physical traits. Don't worry about running of suspects out any time soon either; there are millions of different faces that could potentially appear. Points are awarded for speed and accuracy, with a bonus multiplier that increases for as long as you don't make any mistakes. It's a good way to quickly test your skill, and there's even an online leaderboard that you can use to share your best scores. It resets every week however, so there's always a chance for someone new to become the top agent. In addition to online leaderboards, "Challenges" can also be sent and received from other players via StreetPass. Upon completing a randomly generated game in Round Up mode, you can choose to upload an exact copy of that game as a challenge, and send it to whoever you happen to come across while out and about. There's a special menu that keeps any challenges you receive, and a sense of satisfaction is earned when you manage to trump a random player's score or see someone fail to better your own. While this is more limited than the Facebook integration of the original version, it's still nice to see that Lightwood Games managed to implement this competitive aspect in some way. The secret agent aesthetic is really only a pretty thin veneer, with light jazz music and a few tuxedo-clad images of Dan McFox himself setting a tone that doesn't quite follow through. Suspects cry out with some funny quips after being caught, and the visuals themselves are clean, but this simplified approach could have been made much more interesting with different backgrounds or some animations at the very least. The faces themselves are rendered in a generic, cartoony style, which works well most of the time but it isn't always perfect. The game's accepted definition of 'spiky' hair is debatable for example, and it's difficult to tell the difference between normal glasses and sunglasses, but these minor hiccups won't leave you stumped for long. In fact, the game is actually quite easy, and you can breeze through all 60 set missions in a couple of hours at most. The Round Up mode has a bit more life in it thanks to leaderboards and StreetPass integration, but even that will begin to wear thin very quickly if you don't break up your play sessions. If you use your 3DS while on the move or like to kill 10 minutes every once in awhile, the budget price makes this one a fairly solid recommendation - just don't expect it to go above and beyond the call of crime-fighting duty. 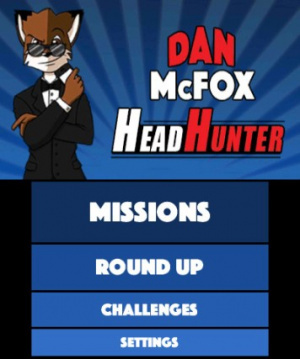 Having been ported from mobile devices, Dan McFox: Head Hunter is understandably simple, straightforward, and best suited to shorter play sessions, but there's fun to be had just as long as you like the core concept. Using an expanded version of 'Guess Who?' to hunt down wacky criminals is a suitably light-hearted way to pass a few moments, with online leaderboards and SpotPass challenges bulking things up a little with a competitive slant. What you see is pretty much what you get, so as long as you aren't expecting a real spy thriller then the price is just about right on this one. @davidevoid Two of them are the same screenshots. I hope nobody buys this expecting a Star Fox clone after being disappointed with Star Fox Zero. I saw this on the eShop and the art indicated, to me at least, that it wasn't going to be very good. The art isn't all that great...the people especially look tragic. Wow, this is real. Ithought it was a joke article made because news is so slow lately. This game now also has a release date for North America: Thursday 9th June. Probably the ugliest game on 3DS. Maybe on the world. Eh, I'd rather just play Guess Who? Is that seriously Comic Sans? I love nintendolife but you guys are so positive I feel like every game scores at least +1 too much. With absolute perfection being 10/10 is this seriously a 6/10?